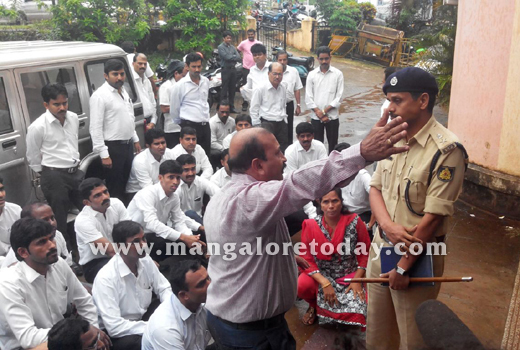 Mangaluru, July 31, 2015 : A flash protest outside the Kadri Police Station by lawyers on July 31, Friday to condemn the alleged assault on their colleague by the inspector, resulted in a tense situation. The allegation of the lawyers is that advocate Uttam Rai who had been to the station with his client Ratnaker of Bhuvi Enterprieses was abused and assaulted by the Inspector TD Nagaraj, while the cops claim otherwise and state that it was the advocate who first assaulted the inspector. 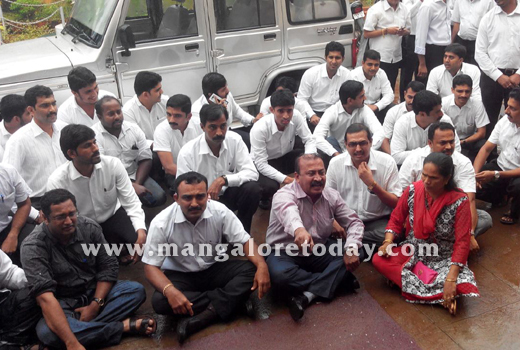 The protesting lawyers demanded suspension of the inspector and also wanted the Commissioner to visit the spot. 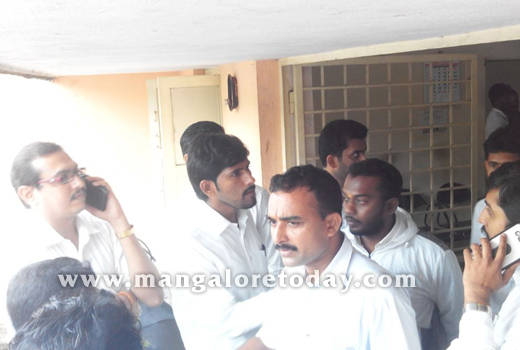 According to Kadri inspector Nagaraj, he had summoned Ratnaker of Bhuvi Enterprises for an enquiry following some complaints against the firm. He said he was unaware that Uttam Rai who had accompanied Ratnaker was a lawyer and had asked him to wait outside when he enquired Ratnaker. The inspector said as the two had come during lunch time, he later asked Ratnaker to come at 5pm which was objected by the lawyer. The allegation of the inspector is that as he walked out of his chamber, the lawyer stopped him and hit him. 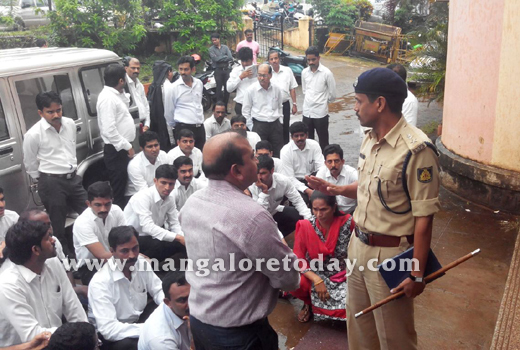 Mangaluru Bar Association President Chengappa meanwhile arrived at the station and spoke to ACP Tilakchandra and other police officials. It has been learnt that the advocate Uttam Rai has been taken to the hospital.